You may not have recognized their names, but you doubtlessly remember something about the four girls who were tragically killed 50 years ago today in an act of racial violence. 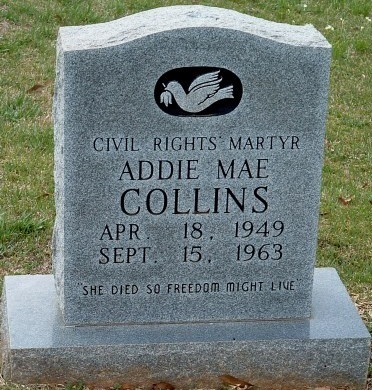 It was 10:22 on Sunday morning, September 15, 1963, when a bomb exploded at the 16th Street Baptist Church in Birmingham, Ala., taking the lives of Addie Mae Collins, Cynthia Wesley, Carole Robertson and Denise McNair, and injuring 22 others. As I wrote on his birthday anniversary eight months ago today, not long after Martin Luther King’s powerful “I Have a Dream” oration (on August 28), there was an escalation of violent racism in the nation, and King himself talked about his dream turning into a nightmare. At the funeral service for three of the young women on Sept. 18, King referred to them as “the martyred heroines of a holy crusade for freedom and human dignity.” And so they were. The martyrdom of Addie, Carole, Denise and Cynthia (and others) also paved the way for great achievements of other Black girls. In her mother’s womb at the time of the tragedy, a little African-American baby was born just over four months later and named Michelle Robinson. She is now the First Lady of the United States of America. Extensive commemorative activities have been taking place in Birmingham over the past few days, and this morning the 16th Street Baptist Church is observing the “50th Year Commemoration of the Church Bombing” with Sunday School at 9:30 and the worship service at 10:45. The Sunday School lesson is “A Love that Forgives,” and the guest preacher at the worship service is Dr. Julius Scruggs, president of the National Baptist Convention. This past Tuesday, the Congressional Gold Medals were bestowed posthumously upon those four girls. If they had not been killed, one would now be 61 and the other three 64 years old. The Congressional Gold Medal has been used to honor world leaders, military heroes, scientists, actors, artists, and others. It was first awarded to George Washington in 1776, and was most recently awarded in 2011 to those who died in the 2001 terrorist attacks. The “4 little girls” martyred on 9/15/63 are worthy recipients of Congressional Goal Medal, which with the Presidential Medal of Freedom are the highest civilian awards in the United States. Note: On Friday, Religion and Ethics Newsweekly had a very find segment about the 50th anniversary of the 9/15/63 bombing [click here]. Some images from that 1963 explosion are found on here on YouTube. A song called “4 Little Girls” and some other pictures can be accessed here . And “4 Little Girls” is also the title of a 1997 documentary film directed by Spike Lee; I finished watching it yesterday, and it is well worth seeing. This entry was posted in Regular Post and tagged racism. Bookmark the permalink.